We’re not sure how Deborah Lippmann manages to launch one epic nail polish collection after another, but we’re so glad she does. For summer, she just debuted a quartet of desert-inspired hues (Coachella mani, anyone?) that will make any other neutrals in your arsenal feel boring. The limited-edition Painted Desert collection takes you on a road trip through the Sahara Desert, with each shade reflecting “the desert’s remarkable beauty and rich, earthy landscape.” The line includes Shifting Shades, a light khaki; Terra Nova, a warm caramel; Desert Moon, a pebble gray; and Love in the Dunes, a purple mauve. Each one provides full coverage in just one coat (it’s true, we tried them all). In light of the highly-anticipated Coachella weekend kicking off tomorrow, Lippmann was inspired to create a super chic, negative space manicure using her new collection. 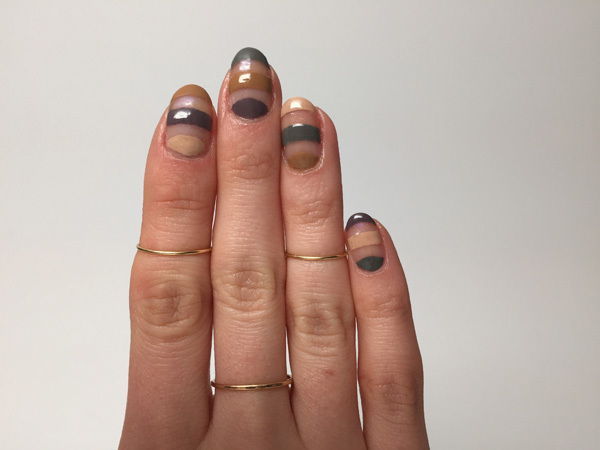 Here she gives us a quick breakdown to create the striped negative space nail look before you hit the desert. Step 1: Apply Deborah Lippmann Fast Girls base coat and let dry fully. Step 2: Using French tip guides, or thin pieces of Scotch tape (1/8-inch recommended), place two across the middle of each nail to create a total of three areas to paint. (Note: one color will ultimately be painted at the moon/base, one color in the middle and one color at the tip). Step 3: One nail at a time, paint a section with one of the four shades from the Summer 2015 Painted Desert collection: Shifting Sands, Terra Nova, Love In The Dunes and Desert Moon. Wait two minutes to dry. Step 4: Quickly and carefully lift the Scotch tape or tip guides, then repeat steps three and four for the remaining nails. 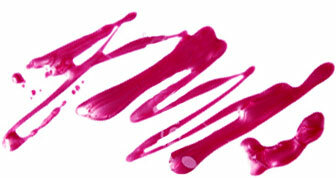 Step 5: Carefully apply a second coat of color to each nail with a nail art detail brush, waiting two minutes to dry. Step 6: Finish the look by applying a Deborah Lippmann top coat, such as Addicted To Speed. Get the entire Painted Desert collection ($18 each) at DeborahLippmann.com now!